Going to the Big "V"
Also, her blinni are as delicious as ever. In all, people haven't changed much, it was nice to see and talk with the people I knew from the American home and around town. 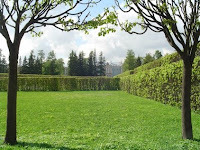 I have to admit, that even though I was only there for two days and the weather was horrible, I felt no small amount of nostalgia for my little slice of the "real" Russia. 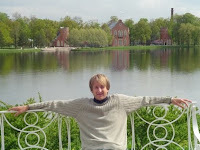 I've been to Tsarskoe Selo, also known as Pushkin, and its palace before. 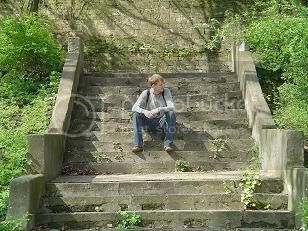 Our group went last Thursday and so I went along to just take pictures and have fun. Also, I came away with a scarf for "Zenit," the local football team which won a major European championship last week and is kind of the talk of the town right now. So, if you've read my blog before, you've probably heard me complain about making change: breaking a 1000 ruble note (about 40 bucks) is really hard and cashiers generally complain if you don't have correct change. For that reason, today at the grocery store I thought I was doing well. My total was 158.45 and I handed over 1,000 rubles. As I started to and over the 8 rubles 50 kopecks, the cashier, in a very sharp tone typical for Russian cashiers, informs me that she's "not interested in the little stuff," and gives me all the coins and everything. I understand nothing about this place. . . 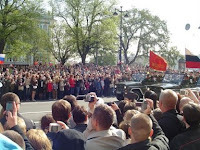 In Russia, May 9, the holiday celebrating victory against Germany in the war is still a big deal. Our first morning here was the parade and such in Palace Square. 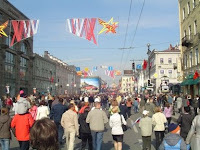 The first picture is Nevskii Prospect, closed off to help get people to the square. The second is a picture of part of the parade, which was really hard to get a spot to see from, even for someone as tall as me. Otherwise, things are going fine. The hotel/apartment where we are staying is spartan, but fine for six weeks. The other people on the program seem cool. We've had a couple of days to get acclimatized and now we have our first day of class at Smolnyi sobor' tomorrow. I finished my first semester of grad school last Friday. It's so hard to believe the first year had come and gone, it went so quickly. I'm leaving on Wednesday morning for Russia. 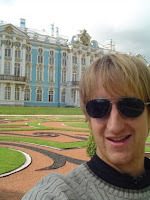 I will be in St. Petersburg from May 8-June 26 for a summer language program and hope to update some about the city and anything else I come up with. May 9th and Victory Day, plus trips to Tallinn, Estonia, Moscow and, hopefully, Vladimir are on the agenda, but no matter what I do I think it will be great. Even greater, though, I'm off to exciting Morocco after Russia for about six weeks to stay with Molly and possibly teach English a little. No matter what I do, she and I are going to have a great time there! Look for new updates from Russia soon!